A giant industrial generator rages behind her—the power is out again and noisy generators on street corners around the district are roaring into action—but Maryamana, “Mother Mary,” gazes serenely down on the traffic fuming and stalling around her in Ankawa, a suburb of Erbil. 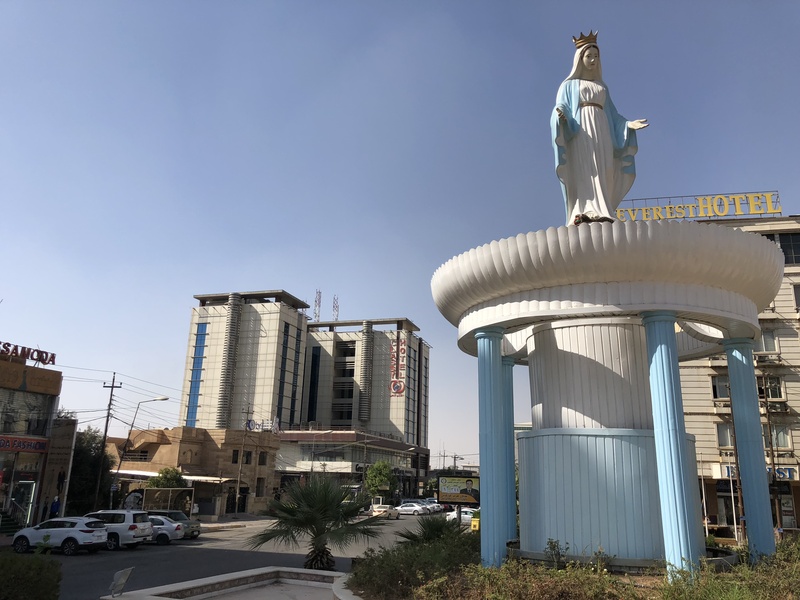 Travelers visiting Iraqi Kurdistan for the first time may be surprised by the giant statue of the Virgin Mary at this busy square not far from the U.S. consulate, but Erbil is known for its ethnic and religious diversity, and Ankawa is a largely Christian community. The Diocese of Erbil is building another Maryamana just down the road. This one is the Maryamana Hospital, a 90-bed facility with every modern medical capacity imaginable; it is scheduled to open in the new year. The property had been a near-completed shopping mall before its resurrection as a hospital. Abandoned by financiers during the region’s ongoing economic crisis, it was adopted by hundreds of families who had fled Mosul or Christian communities nearby during the ISIS onslaught in June 2014. The families squatted here until they found alternative housing, fled Iraq completely or—for an increasing number of Christian families over the last year—had the opportunity to return to their former homes. The hospital’s promoters hope it will be a beacon of mercy and hope for Christians and other religious and ethnic minorities of northern Iraq now that large-scale combat against ISIS appears at an end. The hospital’s promoters hope it will be a beacon of mercy and hope for Christians and other minorities now that large-scale combat against ISIS appears at an end. Another prominent structure just down the street from the statue of Maryamana is St. Joseph’s Cathedral. Its compound, which includes the residence of Erbil’s Chaldean Archbishop Bashar Warda, has turned over a yard inside to straggly grape vines that may one day be changed into wine. It is small evidence of a normalcy that is struggling to return since Daesh, as ISIS militants are known here, were obliterated by Iraqi, Kurdish and U.S. forces or driven from the region (or, as many worry, became “shaved beards” and melted back into the community). Just months ago these same grounds were crowded with thousands who had fled from Daesh into the bishop’s care with just the clothes on their backs. Scores of families who now live scattered across Ankawa can tell the same story as Maryam, 22, and her sister Wasan, 18. After days of rumors of Daesh mayhem and the sound of gunfire and explosions approaching, they fled with their siblings and parents on June 10, 2014, minutes ahead of Daesh but not before they were beaten out of the city by escaping police and Iraqi security forces. Maryam remembers watching the soldiers strip off their uniforms as they made their escape ahead of the terrified Christian families of Mosul. They knew that the road to Erbil was being cut off by the Peshmerga, the Kurdish defense force, so Maryam and her family fled toward Dohuk. A trip that normally took one hour became a 22-hour ordeal for the family—trapped in a giant traffic jam of terrified Mosul residents even as the sound of gunfire grew closer. A trip that normally took one hour became a 22-hour ordeal for the family—trapped in a giant traffic jam of terrified Mosul residents even as the sound of gunfire grew closer. After surviving on the kindness of friends in Dohuk, the family went to Jordan hoping to find an option for refugee resettlement in Europe or America. Nine months later they returned in frustration to Iraq, this time to Erbil. Now the sisters attend the Catholic University in Erbil, which opened in 2017. They hope to prepare themselves there for whatever the future might bring. Though their home miraculously survived ISIS occupation and then a massively destructive offensive to drive the militants out of Mosul, it was pockmarked with bullet holes and stripped of every belonging and fixture. But it is not their childhood home’s structural state that keeps them away from Mosul. Their father, Yusif, has little confidence in the family’s future in Erbil, but he insists that he and his children will never go back to Mosul. “How can we live with them again?” Maryam asks of former neighbors who welcomed ISIS even as they and the other Christian families fled in terror. How can they accept the neighbor who joined ISIS and contacted them while they lived in Dohuk, urging them to return but only after converting to Islam? “How can we live with them again?” Maryam asks of former neighbors who welcomed ISIS even as they and the other Christian families fled in terror. Yusif is ready to leave Iraq behind forever if another nation accepts him and his family. How can the world stand by and do nothing to help them, he asks. He does not understand this silence before the massive groan of Christian suffering in Iraq. The night before, two young men of Erbil shared their own experience of living as members of a Christian minority in Iraq. One, Ramin, had fled with his family from Kirkuk even before ISIS attacked, after death threats from his Muslim neighbors. The other, Alin, says life even in an Iraqi city more at home with diversity like Erbil can be filled with obstacles and petty indignities to members of a minority faith. Yet these two say they plan to stay in Erbil and see what the future will bring, to try to build lives here. Their resistance to leaving is partly practical—they recognize the increasing obstacles to legal asylum in Europe and the United States and simply do not want to start all over elsewhere—and partly emotional and spiritual. “This is where my family is; this is where my friends are; this is where my church is,” says Alin. “We [Assyrian Christians] are the indigenous people of this land. We built this civilization, we built this country.” He intends to stay, though he knows the odds are against him. Does he hold out any hope for Christians in Iraq? And children in the future? They are too young for that, Ramin and Alin say. And who could think of such in Iraq the way it is today? None of their recently married friends, at least the ones who haven’t left the country, are thinking about having children, they say. Before the U.S. invasion of Iraq in 2003, the Christian population, already significantly diminished by years of economic sanctions that pushed the well-off and educated out of Iraq, had been reduced to perhaps 1.5 million people. After years of Daesh terror and the devastating response to it by coalition forces, the number of Christians in the entire nation is by even the most optimistic estimates no more than 250,000 to 300,000. There may be as few as 150,000 left. Yet backed by the Nineveh Reconstruction Committee and the vision and energy of the omnipresent Archbishop Warda, many in and around Erbil and Mosul are struggling to reverse the flight of the world’s oldest Christian communities. The hospital, new apartments for young married couples, shops for new businesses and jobs for Erbil’s well-educated and restless youth are part of the diocese’s vigorous efforts to rebuild Christian villages and communities and ultimately a Christian presence and identity in Iraq. This week I will be visiting some of the places where that restoration is happening in Nineveh and northern Iraq, hearing the stories and considering the obstacles and prospects for success of this historic reconstruction effort. “It is one thing to rebuild a house,” says a priest at work among displaced people here in Erbil, “and we need to do it.